When you commit your grain to an AWB pool you have a choice of payment options. These payment options provide you with the flexibility to time your cash flow and proceeds to meet your needs. 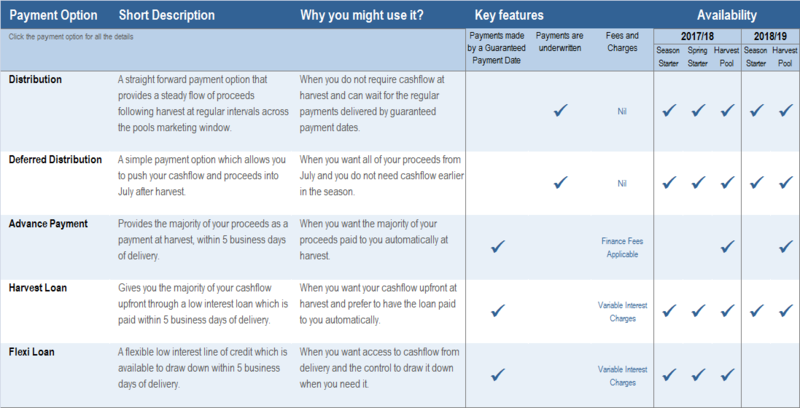 Below is some information on the current AWB pool payment options to help you make the choice which best suits you. Select each AWB pool to see when payments and cash flow become available to you including the guaranteed payment dates for each pool. * 85% of EPR published at contracting less capped costs, supplier liabilities and estimated interest paid within five business days of delivery. Note: Unless otherwise indicated, cash flow percentages reflect cumulative percentage of EPR. Costs are deducted from payments, however timing and percentage deducted per payment is dependent on payment choice. Please use the AWB Pool Returns Calculator for further detail. Harvest payments and credit limits are available five business days from delivery. Payment percentages are estimates only and not guarantees as we do not want to limit pricing opportunities. *80% of the Nominated Estimated Pool Return (NEPR) less deductions, supplier liabilities, financing costs and applicable quality premiums/discounts paid within five business days of delivery. **80% of the NEPR less deductions, supplier liabilities, estimated interest and applicable quality premiums/discounts paid within five business days of delivery. Note: Unless otherwise indicated, percentages are estimates only. For distribution and deferred distribution payments (and loan repayments) percentages are a cumulative percentage of the estimated pool return, deductions, supplier liabilities and quality premiums/discounts which are applied to each payment. Please use the AWB Pool Returns Calculator to view further details on pool payments or view the AWB Harvest Pool terms and conditions. Payment percentages are estimates and not guarantees as we do not want to limit pricing opportunities. These guaranteed payment dates throughout the year make it easier to manage cash flow. Our guarantee is for the date of the payment only. To the extent that a payment is not made by the guaranteed time, AWB offers to pay farmers interest at the rate of 18% per annum for each day that the payment is delayed.